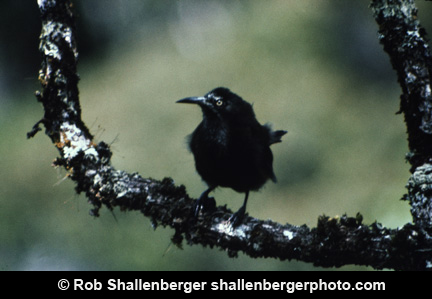 The Kaua'i O'o, a small forest bird, was once found on the Hawaiian Island of Kaua'i. Sadly, the O'o's song was heard for the last time in 1987. The native birds of the Hawaiian Islands have been hit hard by changes brought about by humans. Habitat destruction, introduction of non-native species, and slaughter of native species have taken a drastic toll on the animal and plant life of Hawaii and islands throughout the world. Learn more about American Bird Conservancy's work to reduce the decline of threatened or endangered Hawaiian birds. The native birds of the Hawaiian Islands, like birds of many island groups, have been hit hard by changes brought about by humans. Habitat destruction, introduction of non-native species, and slaughter of native species have taken a drastic toll on the animal and plant life of Hawaii and islands throughout the world. At least ninety percent of the bird species driven to extinction in recorded history have been [Pause] … island-dwellers. The demise of the Kaua’i O’o was greatly hastened by mosquito-borne avian diseases, where neither the mosquito nor the disease was native. At least we have this recording of the O’o’s song to remember it by. American Bird Conservancy is working to reduce the decline of threatened or endangered Hawaiian birds. Thanks to ABC, all native Hawaiian birds are now protected under federal law. Learn more about the birds and the programs to protect them at BirdNote.org. I’m Michael Stein. Call of the Kaua’i O’o provided by The Macaulay Library of Natural Sounds at the Cornell Lab of Ornithology, Ithaca, New York. Recorded by R.J. Shallenberger. Hawaiian forest ambient  recorded by G. F. Budney.